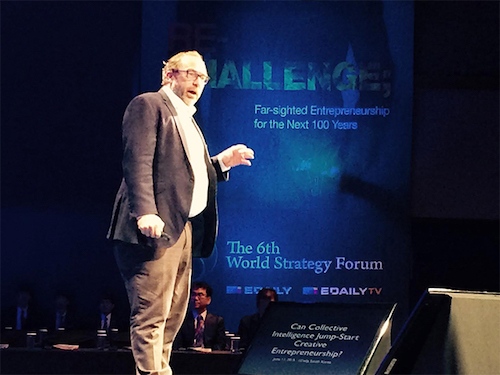 When Wikipedia founder, Jimmy Wales, took the stage at Edaily’s 6th World Strategy Forum on June 11th at the famed Shilla Seoul, his keynote about how he became an entrepreneur was very personal. With a comical flare for storytelling, he carefully laid out many of his failed attempts for launching businesses prior to Wikipedia. Entrepreneurship comes in many forms, but startups like Wikipedia are niched in the rarest of all categories now referred to as unicorn companies. Unicorns fall into a one-in-a-million classification where companies like Uber, Dropbox, Airbnb, Pinterest, and Snapchat have revenues that grow exponentially into the billion-dollar range seemingly over night. They also represent foundational shifts in the way the world does business. This was exactly what drove the people behind the 6th World Strategy Summit to focus on entrepreneurship, and what the startup communities of the future will look like. Following Jimmy Wales on stage, I decided to draw attention to the undefined white spaces in our future, what I referred to as the 10X mega projects capable of unleashing the unicorn companies of tomorrow. In my 20 minute talk I mentioned a number of possible world-changing projects including the whole earth genealogy project, creating a global language archive, space-based power systems, asteroid mining, colonizing other planets, floating cities, and sending a probe to the center of the earth. Each of these ventures is waiting for someone to take the lead and create an entire new industry around them. From a big picture perspective, there are a number of daunting challenges ahead. Being landlocked by North Korea, lacking a startup culture, having the world’s lowest birthrate, sitting in the Asian shadows of China and Japan, and having a relatively small population of 50 million, forces the country to wield less influence than they’d like. Landlocked by North Korea – With North Korea preventing highways, trains, and other forms of ground transportation from passing through, South Korea has been limited to air and sea options for dealing with global trade. Even though the isolation of North Korea is not sustainable and will eventually implode, it is a top-of-mind issue that continues to plague the good people of Korea. Innovation Centers – Silicon Valley’s approach to innovation has focused on creating fertile breeding grounds for breakthrough thinking. Coworking spaces combined with incubators, makerspaces, angel and venture capital, advisor networks, and mentor teams comprised of serial entrepreneurs all play a role in the Valley’s constantly evolving primordial birthing zones. Startup Cultures – Without a proven best-of-class business model to draw from, Korean efforts have tended to lag behind. Korean culture also has fewer heroes in the startup arena to draw inspiration from. Since startup cultures are primarily driven by young risk takers, declining birthrates are posing a number of challenges to making this cultural shift. Declining Birth Rate – At the same time, a declining population poses a much bigger threat. Without an open immigration policy and exceedingly high expectations from those brave enough to raise kids, unfilled worker spots combined with a constantly eroding consumer base will eventually cause the supply and demand equation to go into a tailspin. Sitting in the Shadow of China and Japan – If we look closely at the political gamesmanship being played by both China and Japan to gain a competitive advantage as well as global mindshare, it’s easy to see that South Korea’s battle to the top is far from over. A Country of 50 Million – The Korean language is spoken by roughly 80 million people worldwide. Most are in North and South Korea. For Korean leaders to play an effective role on the world stage, they need to be fluent in two or more languages with the second being a language like Mandarin, English, German, or Russian. For me it was easy to fall in love with Korea. Great food, great passion, and an unwavering determination to be the best of the best. More than virtually any other culture, they spend their time thinking and planning for the future. But the future is never a destination, always a journey. Even with significant challenges ahead, the next chapter for this great nation will prove to be even more exciting than the last. A phrase that I often use is, “the future favors the bold,” and South Korea is in a perfect position to become the boldest of the bold.